Trimming the fat from your business IT support plan. Businesses today have many options when it comes to their information technology services. Many IT consulting companies across Green Bay are demanding that customers sign a fixed price multi-year agreement with claims of complete management and systems support. 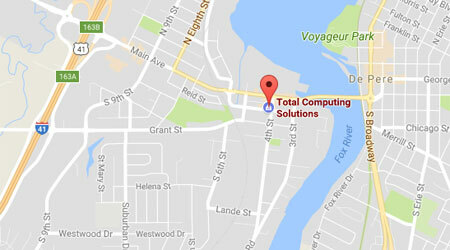 Total Computing Solutions feels differently about this. We understand companies need choices when it comes to their IT systems support and sometimes a fixed price, monthly contract is not in the best interest of your business. Why be stuck in a long-term contract? The only winning party is the IT services company and their cell phone-like contracts. When you work with Total Computing Solutions, you will receive all the benefits that our competitors provide in their multi-year agreements but with the flexibility of paying for only the services that you actually use. You pay for the services and time we work for you. Pretty straightforward. Unlike our competitors, we are focused on servicing you and your business and billing you accordingly. We know that when your company works with us, our focus is on you. We know if your company is up and running and your staff is is productive and able to get their work done, you will be a happy client, which is our goal from day one of our relationship. Don’t worry. You will get all the same benefits and more. Professional IT Experts: Your company will have a dedicated team of experts, all with one goal—ensuring your business IT systems are up and running around the clock. Help Desk Services: When you need help, our help desk is here to take care of you. You have one number to call for all your support needs. Around The Clock Monitoring: Just like other managed IT services companies in Green Bay Area, we provide you with monitoring and remote support, making sure all your systems are safeguarded. You have nothing to worry about. Our IT systems experts are an extension of your team and our focus is on your complete satisfaction. We invite you to call us at (920) 569-2681, or send our team an e-mail at service@tcsdepere.com. We look forward to helping your business as you grow!